This unusual bronze appears to be unique, and possibly created using the direct lost-wax casting method, which produces one-off casts. The maker is unknown, and previous attributions to the Florentine sixteenth/early seventeenth-century workshops of Giambologna and Pietro Tacca are now considered untenable. The iconography appears to be symbolic, although it is now difficult to unravel its precise meaning. In the early middle ages a monkey or ape symbolized the devil, was a personification of evil and closely associated with carnal desires and heresy. The presence of four small demons around the base of the inkstand appears to support this association. However, it is possible that they are later additions, particularly as there is a shorter set of baluster-shaped feet positioned more appropriately on each side of the base. If these had not originally been functional, they would make little sense. The representation of the monkey taking or holding a human baby has medieval origins. There appears to be a dichotomy between the nurturing image and the wicked image (the latter often associated with folklore stories of the ape stealing a child as punishment or as a warning to children who misbehave). The stealing of babies is also associated with tales of changelings and the legend of St Stephen (swapped as a baby), as depicted in an early fifteenth-century panel in the Städel Museum, Frankfurt. Here the devil exchanges the baby for a changeling, both in swaddling clothes, in the cradle. The monkey with a baby also appears in an engraving by the Master of the Die, after Raphael, dated c.1532. The design is after the 'Giochi di Putti' (or playing putti) tapestries, a twenty-piece set commissioned by Pope Leo X. A document of 1676 describes one of the tapestries depicting a monkey carrying a swaddled baby. Eight later copies of the tapestries were produced - it is thought by Barberini in Rome - in around 1635. One of these copies entitled 'Two Putti Trying to Stop a Monkey Abducting a Child' is in the Metropolitan Museum of Art, New York. Production of the engraving continued into the seventeenth century, pointing to the continued popularity of the subject. The caricaturing of apes performing human activities was a popular genre of that time, as seen, for example, in paintings by David Teniers. The potentially contradictory behaviour of the monkey - is he nurturing or menacing? - may signal its role as an object for erudite discussion amongst learned friends. The holes in the tree stump indicate that it served as a stand for nibs, making this a highly imaginative and sculptural inkstand, both decorative and functional, as well as the likely catalyst for lively conversation. 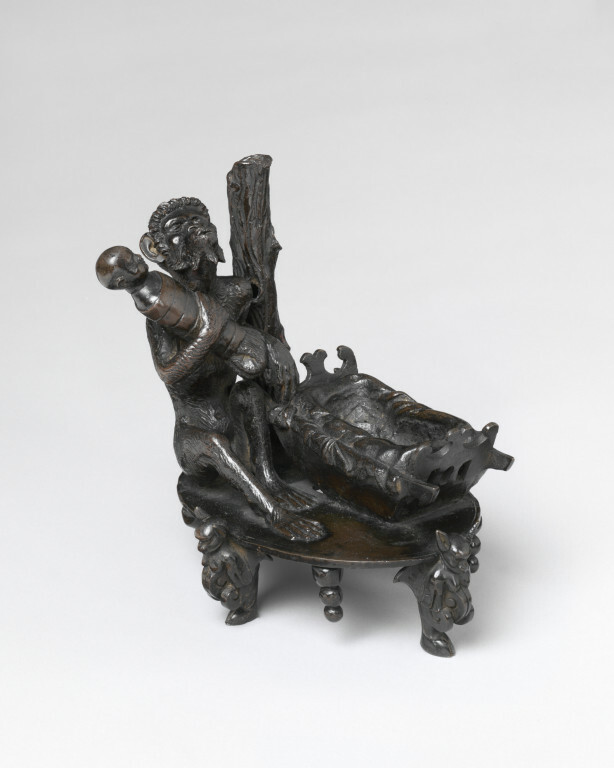 Bronze inkstand depicting a monkey taking baby from cradle. The monkey seated beside a hollow tree stem, clasping with its right paw a swaddled baby; the left paw rests on the empty cradle. On an oval base, with four feet in the form of demons rising out of volutes, and four baluster shaped drops. Acquired as part of the Salting Bequest in 1910. Bronze inkstand depicting a monkey gazes upward, seated beside a hollow tree stem and clasping in its right arm a swaddled baby that he has lifted from its cradle, on which the monkey rests its left hand. The group is set on an oval base with four feet in the form of demons rising out of volutes, and four baluster-shaped drops. Penny, Nicholas. Catalogue of European Sculpture in the Ashmolean Museum, Vol II, Oxford, 1992, p. 190.